We’d love your help. 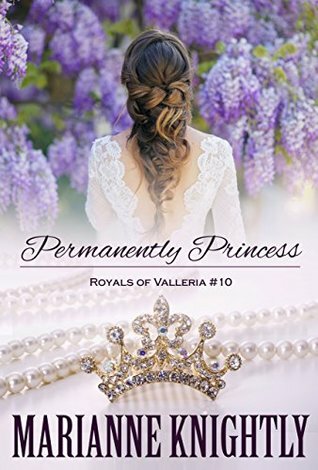 Let us know what’s wrong with this preview of Permanently Princess by Marianne Knightly. Lady Grace’s tragic past meant a child would be nearly impossible. Could one pregnancy test change everything for her and her prince? One royal baby (at least). To ask other readers questions about Permanently Princess, please sign up. Part of the Royals of Valleria series. It was a very delightful read. These couples have problems like any other couple. It's heart wrenching drama and angst. But the love this family shares holds them together. Nobody is perfect but the hope they send out is admirable. Well, no one can say there isn't drama in these books. But to me, because it was a novella ... it all felt pretty crammed up and I'd have enjoyed it if the focus would be on just one or two couples, not pretty much EVERYONE. Still, a quick and easy read. Wow Marianne I absolutely loved this. It's great to catch up with other couples, and get caught up in their lives. I laughed out loud.....I cried and that's when I know I have read a great book. I love the books in between the main stories. This series is one of my favorites and I love how they are written.